The latest step in SEVs renewable energy program is a new 12 MW wind farm located in Húsahagi, on the island of Streymoy. Since coming on line in 2014, the wind farm has increased the islands wind share to 26 percent of total electricity production. The latest step in SEV’s renewable energy program is a new 12 MW wind farm located in Húsahagi, on the island of Streymoy. Since coming on line in 2014, the wind farm has increased the islands’ wind share to 26 percent of total electricity production. To overcome short-term variations linked to the variable nature of wind, lasting from seconds to minutes, a 2.3 MW Li-ion ESS has been deployed. It provides ramp control to smooth out sharp increases and decreases in power, as well as frequency response and voltage control services. The use of energy storage also helps to minimize the risk of curtailment during periods of high wind and low consumption. Excess wind energy that cannot be injected into the grid is now stored in the batteries. 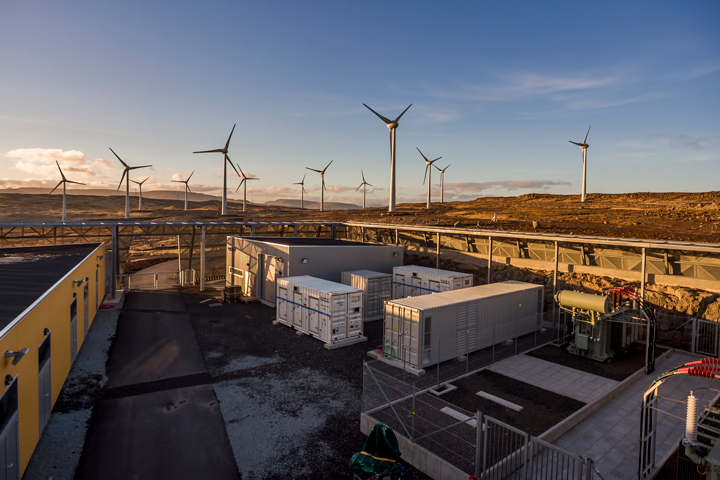 The 2.3 MW ESS at the Húsahagi wind farm comprises two Saft Intensium®Max High Power containerized Li-ion batteries. They were delivered in standardized 20-foot containers for ease of transportation and installation and they integrate the communications interface, battery management and cooling and fire prevention equipment. The batteries are combined with ENERCON’s power conversion and control equipment. The complete installation – wind turbines and ESS – is designed to limit short term power variations in order to maintain grid stability.